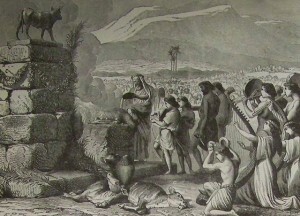 While Moses was on the mountain with God (chapters 24-31), Yahweh God gave the mediator of his covenant with Israel, Moses, very specific instructions concerning the building of the tabernacle—the place where God would dwell amongst his people, as well as, instructiongs concerning the making of its contents, and the establishment of the priesthood—those who would administer the sacrifices that the people would bring in accordance with their law or contract with God. In other words, Moses was receiving detailed instructions concerning the where, when, how and who of how God would interact or meet with or connect with his bride. He was also laying the groundwork for how he would deal with their sinful, disobedient imperfection. How does a perfectly holy and righteous God connect or have anything to do with a very fleshly-driven human being? Both the tabernacle and priesthood would lay the groundwork for this interaction. Note: We are also told in Hebrews that the earthly copy of all this, including the tabernacle, was merely a shadow of the heavenly temple where God dwells and rules his universe from. When Israel’s go-between or mediator, the only tangible connection that she has with her Divine Groom, disappears for almost 6 weeks. The newly married nation-bride, having just taken her final vows with her providential Deliverer, quickly grows impatient and panics. The rest is history. 12 Why should the Egyptians say, `It was with evil intent that he brought them out, to kill them in the mountains and to wipe them off the face of the earth’? Turn from your fierce anger; relent and do not bring disaster on your people. Interesting. This argument continues to this day in the form of “Why does a good God allow evil?” Apparently, it still sells or persuades. Of course my argument is—this is NOT heaven. But it is also not hell. It’s a hybrid, and thus a war, until the resurrection of the dead and the final judgment when evil is finally destroyed and a new heavens and earth are created without evil. Then the argument will be made mute because there will be no evil…no remnants of hell. Only good. Only heaven, as God’s children look forward in hope to, and as heaven’s doubters argue against because this state does not exist on earth NOW! 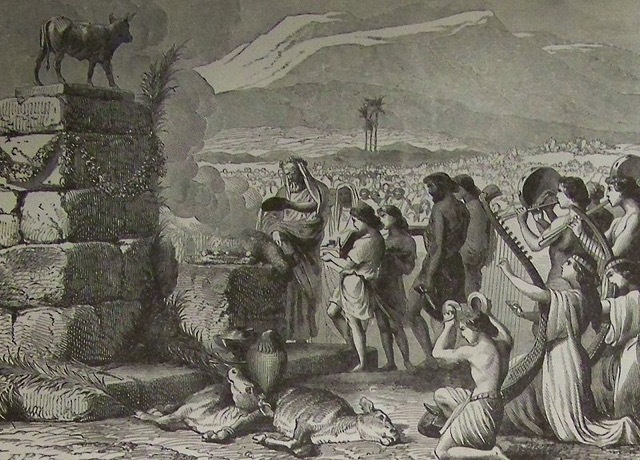 Moses’ reaction must have been very intense for him to have forgotten what he was holding in his hand, and therefore throw to the ground and shattering, not only the handiwork of God, but the visible proof or manifestation of God’s contract with his people. Broken, and shattered in an instant. Aaron does get the story right. He does tell the truth. 3,000 out of 3,000,ooo million is really not a lot comparatively. 1/1000th, or one tenth of one percent. But apparently, for the moment, that one tenth of one percent was enough to re-arrest this drunken, unfaithful national bride’s attention. A harsh and immediate reaction for a severe and immediate betrayal. In addition, losing only 3,000 as compared to the entire nation of 3,000,000 million was certainly a bargain because after all, Yahweh wanted to destroy the entire lot. Moses, as a type of Christ to come, offers his life for his people, if God chooses not to forgive their sin. The discipline…no doubt in order to drive home or anchor the point or truth that while there is forgiveness, there is no free pass when it comes to dishonoring heaven. Summary…The new bride panics and betrays her wedding vows almost immediately. God desires to destroy her and make a new deal with Moses. But Moses intercedes on behalf of the new bride and God relents. 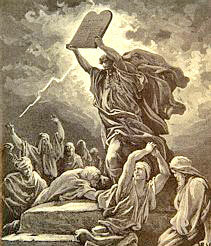 Moses then sees what God had already known and becomes angry himself, destroying the actual contract. He questions Aaron, his brother, as to how all this could have happened. He then takes drastic measures to recapture the attention of the people, sending out one of their own tribes to kill those out of control. Then Moses returns to appease God’s anger. God gives him new conditions. Sinners are out, and there will come a time I will discipline my people, which, in turn God does. Bottom line…The new bride commits adultery; Moses, her legal advocate intercedes; God, the groom, relents; both Moses (the attorney) and God (the groom) severely discipline the new bride. • People are fickle; people are impatient; people will worship something; people will party; people normally only can see today; their vision is so extremely short-term. • Leadership that refuses to take a stand, such as Aaron, is really no leadership at all. Rather it follows those it has been entrusted to guard and protect. • God’s honor will be defended. God seeks those who will righteously obey him; he has his limits; he will not be mocked. • God keeps his promises; God can be prayed too; God does listen; God will forgive, but with boundaries. It is not a forgiveness without discipline or consequences. • There are special people in the world that selflessly stand up for others, such as Moses. He could have had it all, but chose to defend God’s people. Why? For God’s honor? He saw the bigger picture. He knew what other nations might say if something happened to Israel. God was not big enough to deliver. Was he a true God? • Did God want Moses to do this—intercede on behalf of a disobedient bride? Was this a test for Moses to see what he would do? He seems to have chosen rightly. • There are also those that will support strong leadership in a time of crises. They are special people, and they are justly acknowledged. Thanksgiving…I love my wife. I was able to rest today. I was able to fashion a very good outline of the Nail’s prose from 2010. I also reread my more recent prosed versions of ahab, checed and agape, which form the Nail’s critical biblical and lexical backbone—in other words, the Nail’s biblical credibility. I still continue to do much seemingly meaningful counseling. My Spiritual daughter continues to Spiritually prosper. For the most part, over the last two Sundays, I was able to make my case of how the Spirit chose to pour out his blessing upon a small, but dedicated Spiritual whole or one of committed believers, commonly called the Moravians, 300 years ago, and in so doing, after two hundred years of missional lethargy, ignited Protestants to take the good news of God’s forgiveness of man’s sin through the Son of God’s sacrificial atonement for sin to the ends of the earth, just as Christ had commissioned his disciples 1700 years before. Their sacrificial actions not only shaped missions and the progress of the gospel within their own parachurch movement, but their actions also heavily influenced the growth and expansion of both the Methodists and Baptists movements as well. One small group of believers, which under the Spirit’s inspiration became a Spiritual whole changed the face of the planet. Might not the Spirit do that with us, as we teach the world what the Scriptures say about love, joy, truth, community, as well as, Spiritual change, growth and maturity? Perhaps we will be the suffering precursors of a great movement of God’s Spirit, as the Bohemian Brethren, who suffered greatly at the hands of a Catholic monarch, were to the later Moravians. Perhaps, we will be the Moravians, whose first twenty of thirty-one missionaries they sent out died due to diseases they contracted while teaching Caribbean slaves the love, forgiveness and life-changing hope of Christ? One thing is for certain, if God wills it, it will be done. Our only responsibility? Learn to be “Spiritual” with a capital “S,” meaning, within the moral and theological bounds of Holy Scripture’s clearly-intended authorial meanings, learn to discern, understand and be courageously obedient to the Spirit of God’s leading, inspiration and guidance. Not distorting what it means to be “Spiritual” by over-emphasizing or seeking to manipulate the seemingly more spectacular manifestations of God’s truth and power, such as supernatural healings, wonders, signs and the abuse of the gift of other languages, as many do today, and not throwing the “Spiritual” baby out with the dirty bath water, as others are often tempted to do, because it seems to be difficult to quantify what is of the Spirit, as well as, not wanting be associated with those whom we deem as abusing the Spirits inspiration. But a genuine, Scripturally-guarded and supported inspiration of both the Spirit of God’s encouragement and conviction, not only within the the lives of God’s individual adopted, faithful and maturing children, but within the life of collective Spiritual wholes or ones—where two or three are gathered in his name, to prayerfully and Spiritually bind and loose both on earth and in heaven, according to God’s will and good pleasure, and not what we, his children, think his will is, within our broken, misguided and often-times performance-based flesh. And by the way, the Scriptures overwhelmingly teach, as opposed to the Old Testament saints and prophets, which only experienced momentary inspirations of God’s Spirit, we his New Covenant saints, are given the Spirit of God 24-7. It is the Spirit of God, Paul writes that groans with us before God the Father and Son in heaven even, especially when we don’t know the right words by which to ask God for what we Spiritually need (Romans 8). Some might argue, but how do I know if what I am sensing is of God’s Spirit? My answer back: that is no excuse for not trying or learning. In fact, we are without excuse. We have been the presence of God 24-7. What an ignorant, foolish waste of heaven, not to seek heavens’ guidance, presence, truth, power, hope and love in the immediate moment, all because we fear others’ misinterpretation. Foolish. Very very foolish. We have absolutely played right into the Enemy’s hands. Both approaches…too much of a misunderstanding and too little of what we are not for sure about are deadly wrong, particularly in light of the fierce Spiritual battle we find ourselves engaged in (Eph. 6). Therefore, I not only want to teach the world about Spiritual love, joy, truth, community, forgiveness, change and growth, I want to teach the world what it means to be truly “Spiritual,” with a capital “S,” meaning of the Spirit of God. Because in the end, nothing else will matter. Only that which is eternal or of God will survive (1 Cor. 1-3). Any and everything else will be consumed and destroyed by God as the fake spiritual con it truly is. Everything. Struggle…1) Comparing, sorting what I prosed in 2010 before my word studies on love in 2011 and what I just recently prosed from those 2011 study outlines in 2015. This feels like a major undertaking…editing or splicing the two together. 2) Seeking, sensing and trusting the Spirit’s leadership within the daily ministry grind. I sense critical changes are coming. Fortunately, it all does not depend upon me, but my Spiritual dependence, leadership and preparation are definitely critical. But I have a wonderful church body, including eldership, that I believe also wants to be obedient to the Spirit’s leadership. That is incredible. Truth …1) People, as well as, some leadership, can be incredibly impatient, fickle and intimidated by the cultural flesh-driven mob. 2) In the midst of spiritual compromise, imperfect, but well-intended leadership, fiercely protective of God’s honor, but still motivated to intercede on behalf of those who need interceding for, can and will stand in the gap between fallen humanity and a holy God, thereby creating reconciliation between perfect God and man. Of course, Christ is the absolute fulfillment of this standing in the gap between God and man. 3) There will be those who courageously rally to the side of strong, biblical leadership. 4) Despite forgiveness and a survivable, sustainable relationship, there is still discipline, loss and consequences. But what a small price to pay in order to continue the relationship. Application…I am not in this alone. I have Levites, passionately courageous for God’s honor. Now be bold. Intercede, defend, stand in the gap, but be holy. Holy for God. Thus, the price for godly leadership…pain, courage, imperfection, but always God.